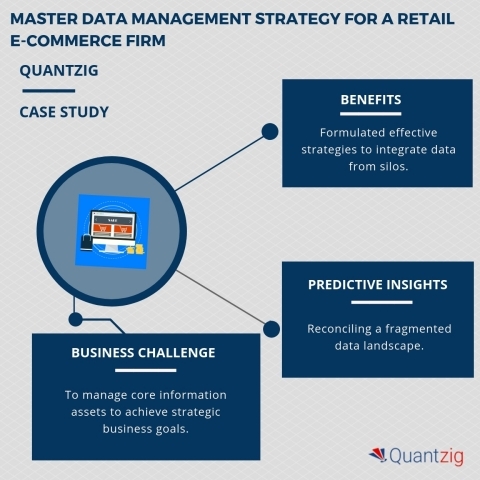 LONDON--(BUSINESS WIRE)--Quantzig, a pure-play analytics solutions provider, has announced the completion of their latest master data management strategy for a retail ecommerce firm in the US. The client is one of the leading players in the retail ecommerce industry in the US. The client is among the few retail industry players who ventured into the ecommerce segment. The primary aim of the company was to manage their core information assets to achieve their strategic business goals. They wanted to develop an effective data management strategy to attain critical business information. The information gained while developing data management strategy would help them gain a consistent view of business-critical data across verticals. According to the data management experts at Quantzig, "The need for data management strategies is expected to increase in the coming years as it helps manage multiple domains like product, customer, finance, and locations." The need for regulatory compliance and faster product launches have compelled companies across industries to opt for an effective master data management strategy. A master data management strategy is crucial for established institutions as it creates a single source of master data that can be maintained by different entities across the organization. The absence of a master data management strategy in any firm may lead to cross-organization data misalignments. This can further result in sub-optimal decision making and decelerating business growth. Book a Solution Demo to see how Quantzig’s data management experts can help you devise a master data management strategy. Quantzig’s solution helped the client to support and implement effective data management strategies that are tailored for the retail sector. With the help of our subject expertise and scrupulous data management methodologies, the client was successful in meeting the deadlines of master data management initiatives. Formulate effective strategies to integrate data from silos. To gain relevant insights and understand the benefits of our data management strategy, Request a proposal. Reconciling a fragmented data landscape. Devising a practically feasible strategy to address various data issues. To know more about the benefits of Quantzig’s data management strategy, Get in touch. Devising a master data management strategy for a retail e-commerce firm in the US.